Copeland Discus and Semi-Hermetic Compressor, spring mounted. Large Electrical Control Panel with Main Power Block. Compressor Contactor and Control Circuit Fuses. High-Low Pressure and Oil Pressure Controls. Suction and Discharge Service Valves. Pre-bent Heavy Wall Copper Tubing, eliminating many joints. High Capacity Receiver with Isolation Valves and Pressure Relief. 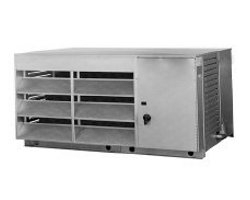 High efficiency Condenser with separate Sub-cooling Circuit. Heavy duty, PSC, Ball Bearing Condenser Fan Motors. Compressor Head Cooling Fan (when required). Heavy gauge, raised galvanized Steel Base. 460V - 230V Control Circuit Transformer on 460V units. Suction Line Vibrasorber, Suction Filter piped to the outside of unit. Liquid Line Filter/Drier and Sight Glass piped to the outside of unit. Flooded Head Pressure Control factory installed.